On September 12th, get ready to take the Slide of Your Life! 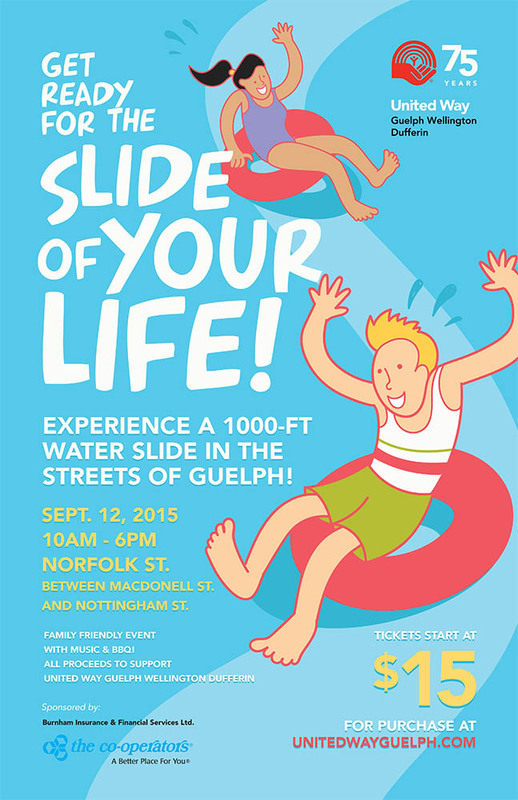 Experience a 1000-ft Water Slide down the streets of Guelph! It’s not every day that you get the chance to slide your way through the City! So get out your inner tube and come and help support our community at the largest Water Slide ever to hit the streets! Did we mention it’s 1000-ft? That’s over 3 football fields! This is a family friendly event, complete with music & a BBQ. All proceeds from the event will support the 2015 United Way Guelph Wellington Dufferin Campaign, which supports 95 local social service programs in our community. Join us at 9:45 a.m. for the official 2015 United Way Campaign Kick-off, with special guest sliders! Burnham Insurance & Financial Services Ltd.
Click on the poster to register for tickets! To get a feel for what this event is like, click on the video below to see other “Slide The City” events! *Please note: The Guelph event is not a “Slide the City” production; but will utilize the same slide. At the Guelph event, all sliders must go down the slide individually and using an inner tube.